Outsourcing is much more than a trend. Companies, in their zeal for a competitive edge, outsource virtually all non-core activities including manufacturing, IT, accounting, sales, human resources and other functions. Engineering and product development are among the last areas affected by this phenomenon. Can new product development (NPD) outsourcing be effective and economical? Why are companies doing it? Is it worth it? What are the issues that prevent businesses from maximizing potential? This paper attempts to define the various aspects of a relationship with a product development outsourcing entity. It also defines various organizational models and attempts to match characteristics of each with outsourcing types. Observations are based on research findings conducted by Syncroness, Inc., a leading provider of product development services within the US industry. Additional factors might exist, based on the particular business situation and market. Based on observation, it is evident that product development departments and divisions are inundated with projects. Corporate management tends to oversimplify the NPD process; therefore, NPD groups are typically overloaded with a diverse range of projects that require varied expertise. This overload is detrimental to business performance. Most organizations would benefit from fewer projects and a focus on their execution with dedicated resources. In effect, that is exactly what outsourcing provides: dedicated resources focused on completion of a single project. All new product development activity relies heavily on the network of vendors, prototype suppliers, etc. These contacts significantly influence the speed of the development. Augmenting internal resources with an outside firm can and should also support the network of suppliers that are involved in the development process. This can help accelerate the project. These powerful factors can be overcome or mitigated by use of an external resource for product development. As organizations grow, less time is spent on NPD versus maintenance of existing products. This is true for most companies. For example, a company might operate well by focusing on the relatively few products within its original focus. However, as additional products are added, a greater portion of the engineering resource is required for sustaining engineering. This limits the time available for NPD. In addition, a larger volume of products leads to a decline in efficiency. This problem worsens until the organization becomes large enough to separate NPD from sustaining engineering and other engineering functions. This is usually only possible in very large organizations. As previously mentioned, most companies have development projects that require diverse skill sets and experience. When relying only on internal resources, it would be virtually impossible to ensure that a necessary expertise will be available when needed. Availability of external resources broadens the knowledge and experience base of your organization. Is All NPD Outsourcing the Same? Our observations arise from companies where all or part of a product is manufactured outside the company. This form of outsourcing continues to grow and often includes some value engineering of components or subsystems. For example, domestic auto manufacturers assemble components and subsystems that are often designed and manufactured by external suppliers. In general, many manufacturers will provide some engineering development in exchange for winning a production contract. Depending on the industry in question, some larger contract manufacturers have complete product development capabilities and will offer turnkey design-and-build services. Many consumer products begin with a design concept with little engineering that is forwarded to the contract manufacturer for engineering and construction. An example is consumer products differentiated by cosmetic attributes. In these cases, the supplier has past experience building similar or even identical products. The use of independent consultants for NPD is a common first foray into product development outsourcing. Product development consultants might be former employees or others with specific field experience. This work is typically task-specific and the contractor provides additional resources rather than taking responsibility for the entire project. The use of contract labor is also common. In this form of outsourcing, individuals are brought on-site to work under the management of the company. This form of outsourcing is often used by aerospace companies that require secrecy and control of the development activities. Most of the independent firms that offer outsourced NPD capabilities are industrial design firms. These firms focus on product aesthetics and appeal to the purchaser. Products are differentiated by controlling the customer experience. While many of these firms employ mechanical and electrical engineers, the focus is often on the front end of the development process, and contract manufacturers are relied upon to generate design and details necessary to begin product production. Globalization makes it easier to tap low-cost labor pools. There are numerous firms, typically based in India and China, which offer relatively inexpensive CAD drafting or design. However, logistics and communication can be difficult. Significant international travel is often required to insure that value is received. The added overhead to manage the project must also be taken into account. Although there are a smaller number of product development companies, they are distinguished by the ability to manage and execute the entire design process up to the manufacturing point. These providers supply not only the development activity itself but the process structure and quality systems necessary to bring most products to market. Over the past nine years Syncroness has engaged a diverse set of customers ranging in revenue size from virtually zero to billions of dollars annually. These customers differ in terms of business type, size, etc. We find that regardless of size, the level of product development maturity is a critical success factor when outsourcing elements as complex as new product development. This maturity level is also influenced by industry regulation and security requirements. It might seem obvious that the lower the level of maturity, the more advanced the services one should solicit in order to compensate. However, the exact opposite is what we observe. Underfunded startups almost always select the least costly development alternatives rather than the most experienced. This usually results in unsatisfactory results for both parties in the transaction. The maturity level of product development organizations correlates directly to the level of expectation regarding NPD projects. We have found that this level of maturity/experience and expectation varies significantly among companies and individuals. Financial expectations of development costs vary from company to company. Issues we believe affect this include levels of NPD experience as well as the levels of understanding of true internal costs and volume manufacturing requirements. Many companies do not value internal and external costs equally. There is a natural tendency to view existing resources as costing little or nothing. Therefore, when considering outside resources, costs can appear higher than expected. 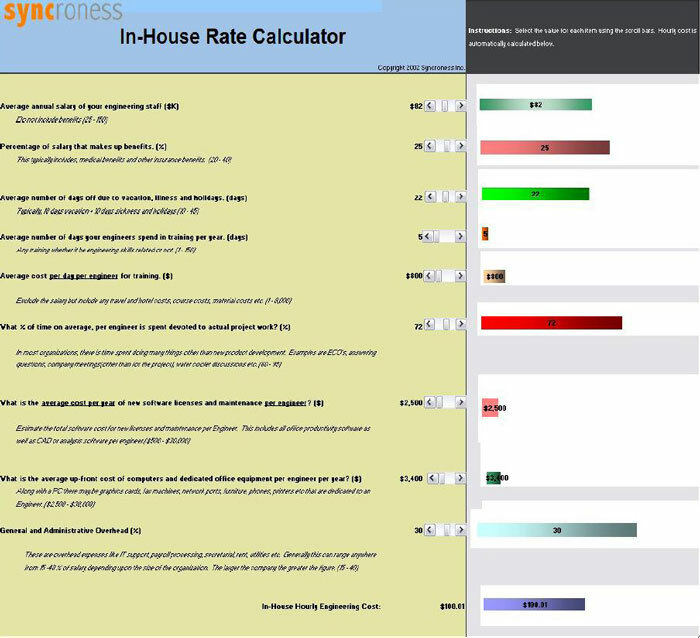 Syncroness created analysis tools that help companies calculate their true internal costs so better decisions about the costs of outsourcing NPD projects can be made (an example and links to that content are included in this document). Two costs are most important. One is the internal cost of hiring and maintaining individual(s). Usually, this hourly cost is similar to the cost of using outside resources. The more important factor is opportunity cost, since the cost associated with delays in bringing the product to market are usually very high. The process of commercialized product development differs from that required to conduct experiments or build prototypes. Often, individuals who have created products on their own have a low understanding of product design for commercialization, which takes into account mass production, quality, marketing and other factors. This lack of understanding of the process leads to unrealistic expectations relating to cost and schedule. Virtually anything can be accomplished from an engineering perspective. However, products are not developed in a vacuum. The design must exist at a cost that people are willing to spend and it must not infringe upon existing intellectual property. Again, the experience and understanding surrounding these issues is critical to insuring realistic expectations for the project. It is relatively simple to obtain quotations on various components of a new product. However, all pre-design quotations contain limited information. A wide range of pricing is often observed for individual components. Suppliers are often unsure what the component will cost. Some suppliers might provide a low quote and raise the price before the product reaches production. Based on a survey conducted by Syncroness, significant resistance to outsourcing of product development centers around learning curves and quality of service. Many companies have horror stories to tell about past outsourcing efforts, due in part to the nature of product development, where designs almost never go according to plan, and to behavioral, learning or business issues. In most cases there is an attempt to outsource that is misaligned with the company’s level of product development maturity. In its analysis of past projects encompassing a wide scope of work over the past nine years, Syncroness has identified several behavioral trends that appear to interfere with the successful outcome of outsourced projects. We find that there is a perception or feeling that the high cost of lessons learned must be repeated. Virtually all manufacturers have paid a high price to learn what they know about a particular product or market. It is natural to believe that anyone working from the outside will not be aware of these lessons and therefore will be doomed to repeat them. An example might be a design issue that became a significant quality concern after launch, requiring replacement or recall. This phenomenon leads to the belief that outsourcing such activity is too difficult, or that without specific expertise in the product area, it cannot be successful. Any product development effort generates a huge volume of knowledge. While some of that knowledge is documented, a large portion is not. Many engineering organizations rely heavily on the “tribal knowledge” of the individuals within the group. It is natural to assume that an outside organization will not have access to similar information and thus will not be effective or it will take a lot of time to communicate this knowledge to them. It is often threatening to work with an outside entity. There exists a subconscious threat of being perceived as incapable, compounding the concern that management might seek outsourcing more frequently to reduce personnel, etc. The result is often subconscious self-sabotage leading to project failure. This then justifies these individuals to avoid outsourcing in the future. We have found this to be a potent dynamic within many companies. It can be unsettling for established development organizations to work with an outside entity. Indeed it does require change in managerial style and therefore the discomfort associated is often perceived as a loss of control or ownership. Additionally, management of an engineering organization is decidedly different from managing an outsourced engineering effort and requires a different skill set. Outsourcing of product development can also be hindered by business issues, such as accounting and adherence to existing procedures. Figure 1 illustrates the issues that prevent companies from pursuing outsourcing relationships. Most companies do not have a good understanding of the opportunity cost of delay on their product development projects. It is clear that this cost is high, but without definition, it cannot be factored into the decision-making process. This can result in a company making decisions on invalid information. As evident in Figure 3, while the cost of outsourcing may be high, the payoff is considerably higher based on opportunity costs. Outsourcing opportunities often arise when a company is in some sort of crisis. They are being pushed to develop a product or products without the required resources or expertise. Therefore, the outsourcing effort is usually unbudgeted. Thus, entering into an outsourcing partnership while under pressure is not ideal. Undoubtedly, managers feel that they are losing some control over any project that is outsourced. This natural reaction is usually without merit, as one often has more control of an outsourced resource than an internal one. Many companies are not accustomed to purchasing a service where the deliverables often arrive by email or other electronic means instead of showing up at the loading dock. This factor can cause delays and additional work to validate with the purchasing department that the deliverables have been achieved. 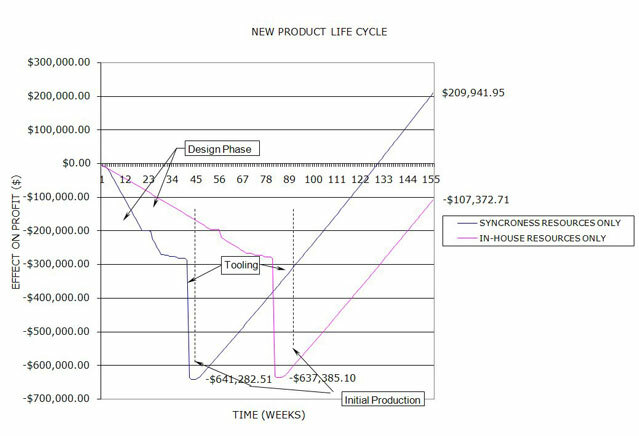 Additionally, product development is a fluid process where the costs are variable. Changes to the contract amounts are common and the process to modify purchase orders is slow, difficult, and impacts the project pace. For this reason, fixed cost pricing is usually preferred over time and materials pricing. “By the time I tell them what to do….” The largest obstacle to effective outsourcing is that it initially requires effort to change existing behavior. However, the benefits over time are significant as we learn to operate in a more efficient manner. There are learning curves on both sides of the outsourcing transaction: those required by the customer and those required by the outsourcing entity or firm to come up to speed on a particular project. It is difficult to document a return on investment for outsourced services. Learning to look at opportunity costs as well as overhead costs, etc., is difficult for most organizations that are driven by profit and cash flow. Reliance on tribal knowledge and time pressures often result in a lack of clear project and product definitions. This effects internal and external developments. However, it is critical to communicate the product definition in as much written detail as possible. As with any development, not all requirements can be defined up front, but the better the definition, the better the project will progress and the less it will cost. All solutions to product design problems are compromises to some degree, and when faced with an outcome, it is natural to question the approach since the compromise design likely will not meet all of the ideal requirements. The trade-off is that a detailed understanding of the compromise would require your participation in all design reviews. The designing entity must be trusted to have done all homework and should show some of the major alternatives and compromises in the design. It is common in all development environments for the stakeholders to want to see immediate progress in some tangible form, such as a 3D model or prototype. However, most larger developments require a significant amount of up-front planning and concept generation that the stakeholders have difficulty perceiving as progress. Further, the cost at startup is usually higher due to the inclusion of a variety of team members in the concept generation process, which is a factor that generates additional uncertainty among the stakeholders. Despite the obvious complexities, outsourcing of new product development has more benefits than drawbacks. Outside companies are almost always faster at accomplishing a new product’s development. This is due to their increased focus and dedicated resources that are applied to the project. In opportunity cost alone, this makes a meaningful cost savings. “Better control” is counterintuitive. One might believe that having daily contact with your engineering staff provides better control, yet the opposite is true. Product development firms are usually bound by cost and budget which highly motivates them to accomplish the work. Internal resources typically are not as dependable nor as motivated. A relationship with a quality product development firm provides a wealth of knowledge that can be tapped at any time. Product development can encompass a vast body of information about process, materials, analysis, prototype methods, etc. It is impossible for any organization to have all the knowledge in all of these fields. Often, the cost of product development is not a main issue, but rather it’s the uncertainty of the cost that is the root of the problem. Use of outside resources assists in improved definition of development costs and reduces uncertainty over time. Most top engineering firms are willing to work on a fixed-cost basis, provided that the project has sufficient definition. Can Outsourcing of New Product Development Work? Communication – We all talk about the importance of communication but often we neglect it. We must focus a lot of effort on quality and quantity of communication. The less process-oriented your organization, the more communication you require when outsourcing product development. Realistic Expectations – Product development is a complex and unpredictable process. You have to be realistic. There are many activities in product development that are not able to be controlled (supplier deliverytimes, for example) and you cannot expect an outsource partner to control these any better than you can. Buy-in – You have to believe. Almost any development goes through periods where the entire project is in question. Don’t be in a hurry to blame the outside resource unless you are sure that they have done something wrong. Too often we are ready to blame before we know all the details or to appease senior management. Blaming will not help get your project done. Resources – Make sure that the partner you select has the resources to help you. This includes things that might be required such as software, communication, and project management tools and other infrastructure. It is risky to utilize resources that do not have proper software licenses and other infrastructure. Knowledge Integration – No one has all the skills to complete every project. Look for projects that require specialized expertise that have to be integrated into the project. How did the company accomplish these? Check Financials – Insure that your outsourcing partner has the financial resources and history that make you comfortable in conducting business with them. Are they large enough to absorb errors? Is their financial house in order? Cultural Fit – Make sure that you have a positive working rapport with the company and individuals you choose. Bear in mind that a larger firm is likely to have alternatives if a personality clash exists. If you are outsourcing for the first time, recognize that as in any other new form of doing business, the most difficult task is to change behavior. It is not possible to outsource and expect your organization to operate in the same way that it historically has. However, the reward for the effort can be significant. By establishing good outsourcing partner(s), you give your company a much more capable and flexible resource to complete products, elements that are becoming increasingly necessary in today’s environment of shrinking product life cycles and rapid innovation. For additional information please feel free to contact the author at jlorscheider@syncroness.com.